Dancing while playing an instrument is no simple feat, but it appears to come naturally to all eight members of The Otone Brass Band. Whether it’s swinging the sousaphone from side to side or spinning and bobbing while keeping a lightning fast drumbeat, it’s clear that every one in the band views each song as an opportunity to party. The vibe is contagious and it’s usually a matter of seconds before everyone within earshot is moving to the beat. The Otone Brass Band brings its lively grooves to the Riverwalk Backyard Amphitheater this Friday for Vail Jazz@ Riverwalk presented by Alpine Bank and Kaiser Permanente. The all-new Vail Jazz@ Riverwalk series kicked off June 9 with The Burroughs, drawing in a sea of picnicking families, passers by and dancers of all ages. The series delivers free live music every other Friday along with local food and drink vendors, including paella from Revolution, paninis and salads from Eat! Drink! and cocktails from 10th Mountain Whiskey. The Otone Brass Band just might take its stage performance into marching mode through the lawn. It wouldn’t be the first time. 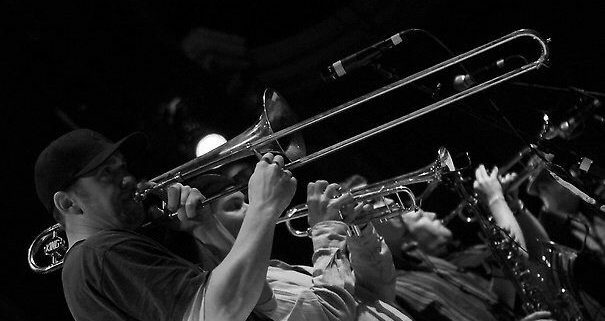 Infusing its New Orleans street sound with strains of Latin, soul and funk, whether on stage or off, the Denver-based ensemble is famous for infecting crowds of all ages with positive energy. If spontaneous dance opportunities aren’t enough for the younger members of the audience, Alpine Arts Center will be on hand offering unique arts and crafts projects for children. Vendors open at 5 p.m. and music begins at 6 p.m. Picnics are welcome but no pets are allowed. The event is non-smoking.